84 Commonwealth is located on the south side of Commonwealth, between Berkeley and Clarendon, with 82 Commonwealth to the east and 86 Commonwealth to the west. 84 Commonwealth was designed by Emerson and Fehmer, architects, and built ca. 1872 as the home of Mrs. Sarah Hook (Appleton) Burnham, the widow of John Burnham. She previously had lived in Brookline. Sarah Burnham purchased the land for 84 Commonwealth on May 2, 1871, from attorney Edward Ingersoll Browne, It was part of two lots he had purchased from the Commonwealth of Massachusetts on April 28, 1871, and May 2, 1871. Edward I. Browne was unmarried and lived at 52 Commonwealth. Click here for an index to the deeds for 84 Commonwealth. By 1879, she had been joined at 84 Commonwealth by her daughter, Mrs. Maria Theresa Appleton (Burnham) Dodge, the widow of Nehemiah Dodge, Jr., and her daughter, Maria Theresa Burnham Dodge. Sarah Burnham died in November of 1884. Maria Dodge continued to live at 84 Commonwealth with her daughter, Theresa. In January of 1892, Theresa Dodge married Amos Lawrence Hopkins. He was a railroad investor and officer. He had been affiliated with the Jay Gould organization until 1889, when he retired to Williamstown (where he had been born) and acquired extensive land holdings. He returned to the railroad business in the 1890s and became President of the New York, Susquehanna, and Western Railroad Company, and receiver of the Chicago and Northern Pacific Railroad. Amos and Theresa Hopkins lived with her mother at 84 Commonwealth until about 1895. During the 1896-1897 winter season, Maria Dodge was living elsewhere and 84 Commonwealth was the home of Mr. and Mrs. Charles A. Reed. By 1898, however, the Reeds were no longer living there and it was again the home of Mrs. Dodge,. By the 1901-1902 winter season, Amos and Theresa Hopkins had once again joined her at 84 Commonwealth. The Hopkinses purchased 46 Commonwealth in October of 1902, and they and Mrs. Dodge had moved there by the 1904-1905 season. By rhe 1904-1905 winter season, 84 Commonwealth was the home of Mrs. Loula (Henslee) Clark Engelmann, the widow of Benjamin Oliver Clark and of Dr. George Julius Engelmann, a gynecologist, who had died in November of 1903. Prior to his death, the Engelmanns had lived at 208 Beacon. Loula Engelmann’s children by her first marriage — Dr. George Oliver Clark, a physician; John Dudley Clark; and Louise Clark — lived with her. J. Dudley Clark married in April of 1904 to Cornelia Thayer Andrew. After their marriage, they lived at 408 Beacon. Louise Clark married in October of 1909 to Dr. Rufus Elijah Fort, a physician, and moved to Nashville. By 1910, Loula Engelmann also had moved (possibly to Nashville) and George Clark was living at 142 Beacon (by 1920, Loula Engelmann was living at 32 Hereford with J. Dudley and Cornelia Clark). By the 1908-1909 winter season, 84 Commonwealth was the home of Samuel Arthur Bent and his wife, Mary E. (Thompson) Bent. Samuel Arthur Bent was a lawyer, author, and educator. He died in November of 1912. Mary Bent and their children, Arthur and Mildred Bent, continued to live at 84 Commonwealth in 1917. In that year, they were listed in the Blue Book both at 84 Commonwealth and at the Hotel Vendôme. 84 Commonwealth was not listed in the 1918-1920 Blue Books. By 1920, 84 Commonwealth was the home of Dr. Worcester Randolph Angell, a physician, and his wife, Helen N. (Hogg) Potter Angell. He also maintained his medical offices there and accepted lodgers. They previously had lived in Brookline. Dr. Angell’s brother, Dewey Angell, a salesman, lived with them from about 1920 through about 1924. On July 1, 1926, 84 Commonwealth was purchased from the estate of Sarah Hook (Appleton) Burnham by Grace L. Stratton, as trustee under the will of John Stratton. Grace Lillian Stratton was the daughter of Francis John Stratton and his wife, Grace Middleton (Metcalfe) Johnson Stratton. She was trustee under the will of her grandfather, John Stratton, a Boston merchant who died in August of 1870. She lived at 232 Newbury. The Angells continued to live at 84 Commonwealth until August of 1928, when their lease expired and they moved to 37 Marlborough. In May of 1929, Grace Stratton applied for (and subsequently received) permission to make repairs to an outbuilding at the rear of the property that had been damaged by fire. In 1929, 84 Commonwealth was the home of Mrs. Susan Jane (Northridge) Taylor, the widow of Thomas Brierley Taylor. She previously had lived at 139 Newbury. Living with her were her children: Lucille F. Taylor, William Randolph Taylor, and Robert Winston Taylor. In 1929, she remarried, to David R. Jones. He was a roofing contractor in Watertown. They operated 84 Commonwealth as a lodging house. Susan Jones also owned 121 Beacon, where she operated another lodging house. She listed her residence there in the Blue Books. They continued to live at 84 Commonwealth in 1933. By 1934, they had separated and she had moved to 59 Commonwealth. On March 27, 1933, the estate of Sarah H. A. Burnham foreclosed on Grace Stratton’s mortgage and took repossession of 84 Commonwealth. 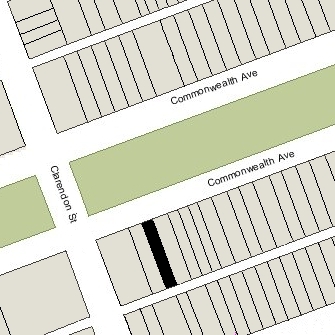 84 Commonwealth was not listed in the 1931-1937 Blue Books and was shown as vacant in the 1935 City Directory. The property changed hands and on December 31, 1934, was acquired by Marion E. (Tucker) Greenwood, the wife of Dr. Allen Greenwood, an ophthalmologist and professor at Tufts Medical School. They lived in Wellesley. They also owned 82 Commonwealth, which they had acquired in July of 1922, where he maintained his medical office and leased residential units and offices to others. In January of 1935, Allen Greenwood applied for (and subsequently received) permission to cut a door between 82 and 84 Commonwealth on the first floor. In the application, he indicated that 84 Commonwealth would be used for medical offices and dwellings, without specifying the number of units. In March of 1936 he applied for (and subsequently received) permission to cut additional doors through on the second and third floors. In 1936, Allen and Marion Greenwood had made 84 Commonwealth their home. He continued to maintain his office at 82 Commonwealth. From the Boston Lists of Residents, it appears that they also accepted at least one lodger at 84 Commonwealth in most years. The Greenwoods continued to live at 84 Commonwealth (and he to maintain his office at 82 Commonwealth) until his death in October of 1942. After his death, Marion Greenwood moved to an apartment at 50 Commonwealth. By 1944, 84 Commonwealth was the home George Francis Berkinshaw Standish and his wife, Rose G. (Bassett/Bassette) Standish. They previously had lived in Newton. He was a realtor and she was a teacher. By 1945, he had died or they had separated, and she was a lodger at 278 Commonwealth. On August 31, 1944, 84 Commonwealth was acquired by Alice Lucinda (Kelley) Cloudman, the wife of Marcellus Emmons Cloudman. They previously had lived at 116 Sutherland Road. Living with them were Bernard Ponsonby Sullivan, the British Consul General in Boston, and his wife, Dorothy Evelyn (Hattersley) Sullivan. His previous posting had been in South Africa. They continued to live at 84 Commonwealth until about 1947, after which he became British Consul General to Costa Rica. 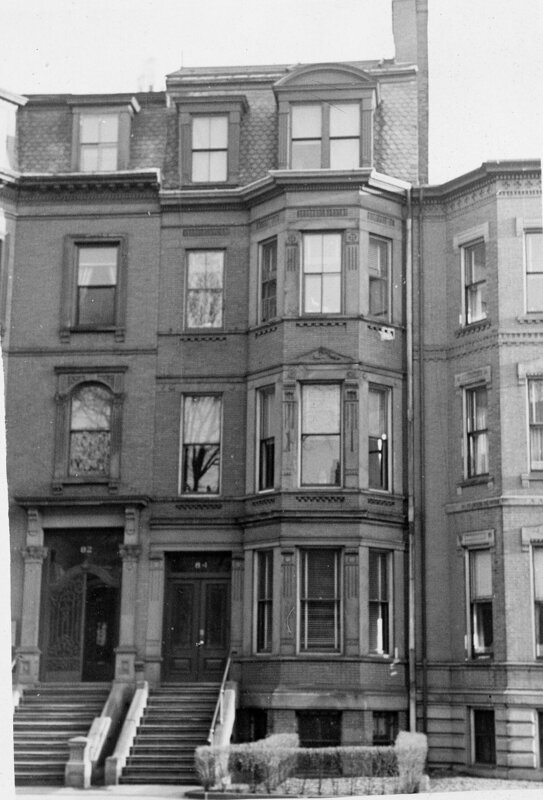 In November of 1947, Alice Cloudman applied for permission to convert the property into six apartments. In the application, she indicated that the property currently was a three-family dwelling. She subsequently abandoned the permit. On February 24, 1948, 84 Commonwealth was acquired from Alice Cloudman by Beatrice Virginia (Bradbury) Porter, the wife of William Julian Porter. They previously lived in Weymouth. They operated 84 Commonwealth as a lodging house. In October of 1948, the Porters acquired 119 Beacon, which they also operated as a lodging house. On December 30, 1952, they transferred 84 Commonwealth into both of their names. The Porters continued to live at 84 Commonwealth until the late 1950s, when they moved to 119 Beacon. On January 14, 1960, 84 Commonwealth was acquired from the Porters by Benjamin Forman and his wife, Eleanor Forman. They lived in Arlington. They acquired 119 Beacon from the Porters at about the same time. 84 Commonwealth subsequently changed hands, remaining a multiple dwelling, either a lodging house or apartments. 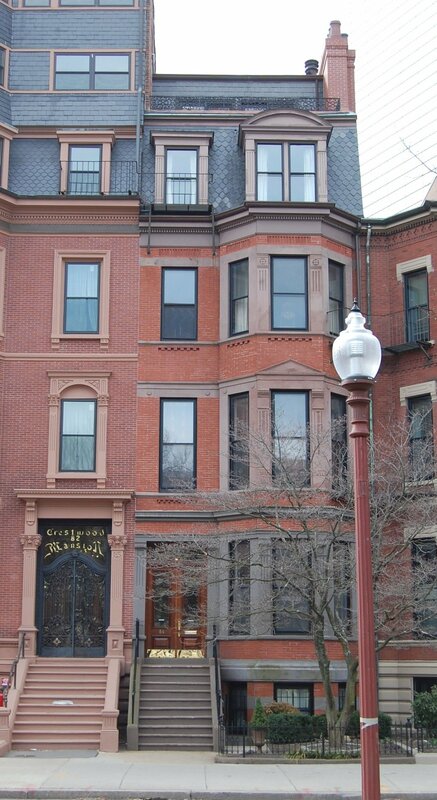 On February 4, 1980, 84 Commonwealth was acquired by John Suchocki, trustee of the Suchocki Realty Trust, who remodeled the house into five apartments. On January 29, 1981, 84 Commonwealth was acquired by Stephen V. Miller, trustee of the 84 Commonwealth Renewal Trust. On April 7, 1981, he converted it into five condominium units, the 84 Commonwealth Condominium.